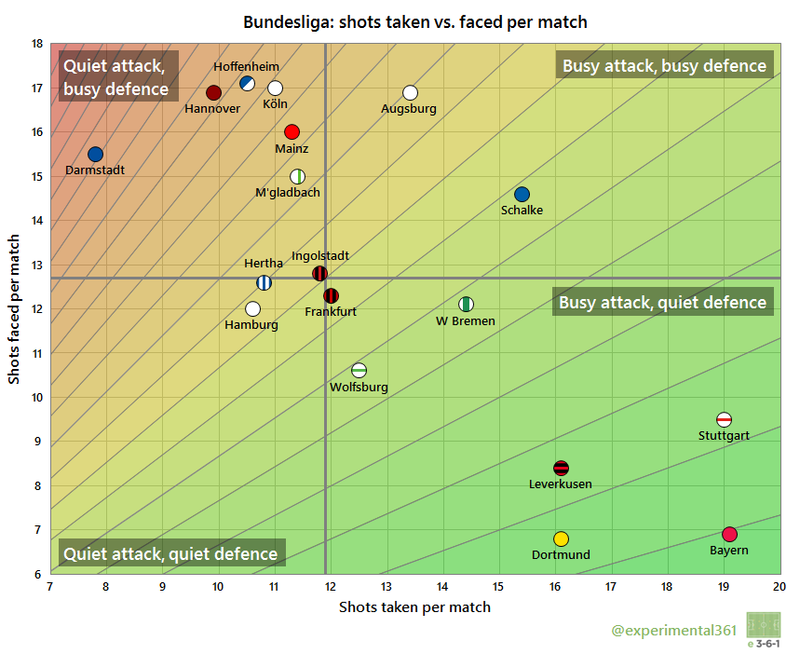 Eight matches played in the Bundesliga is just about enough to justify cranking the shot data through my scatter graphics to compare how each club is doing. These are explained here if you haven’t seen them before and here are last season’s for reference. 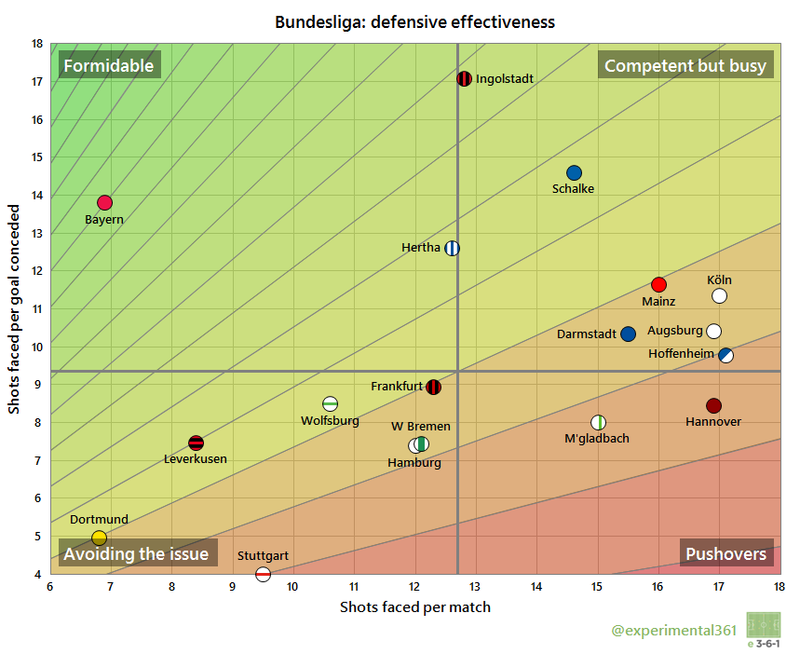 Unsurprisingly we find Bayern in the bottom right “dominant” corner of the graphic, albeit there are three sides – Dortmund, Leverkusen and Stuttgart – who have bossed matches to a similar extent. The latter is interesting because Stuttgart are currently bottom of the division – the other two graphics will shed some light on how this has happened. Newcomers Darmstadt have struggled to create chances so far, firing in fewer than eight per match on average and allowing almost twice as many in return. Schalke and Augsburg matches have been pretty entertaining for the neutral, with plenty of shots at both ends of the pitch. Here we can see one of Stuttgart‘s problems: despite taking almost as many shots as Bayern they have been pretty wasteful so far. However there are three sides who have been even more profligate, chief amongst them Werder Bremen who have needed an average of over 16 attempts to find the net. While we saw above that Darmstadt have struggled to get shots away, they have been clinical with the chances they have created: only the current top two have needed fewer attempts to score each goal on average. Again we see a problem for Stuttgart, who have only been able to withstand four shots on average for each goal they’ve conceded: less than half the average. Dortmund have also struggled to keep shots out: despite allowing a similarly low number to Bayern they have conceded from one in every five efforts they face, which is almost three times lower than the leaders. Interestingly Ingolstadt are at the top of both this graph and the last one: despite taking and allowing an average number of shots, both they and their opponents have found it very difficult to convert chances.